A mud tank for drilling mud process procedure is completed with mud process equipments, pipelines, valves. The tank valves will be different pipeline arrangement to control mud flow. There are different sizes of tank valve for mud suction line, mud mixing line, mud gun line, clean water line. Normally ball valves will be installed for mud gun line and water line normally 2” or 3” size. There are mud gun each tank compartment for flush tank corner and each gun install a ball valve to control the mud gun. The water lines normally sit opposite of mud gun line to supply clean water on tank top or tank inside. Each outlet of water line will set an ball valve for close or open the water jet. The mud suction line for mud pump and mud mixing line for mixing hopper sit at bottom of tank, it will require tank valve with high position control by wheels. Normally we need confirm mud pump and mixing pump can suction from each clean mud compartment, each suction port will install a tank valve to meet requirement. The wheel control will help open or close valve easily. 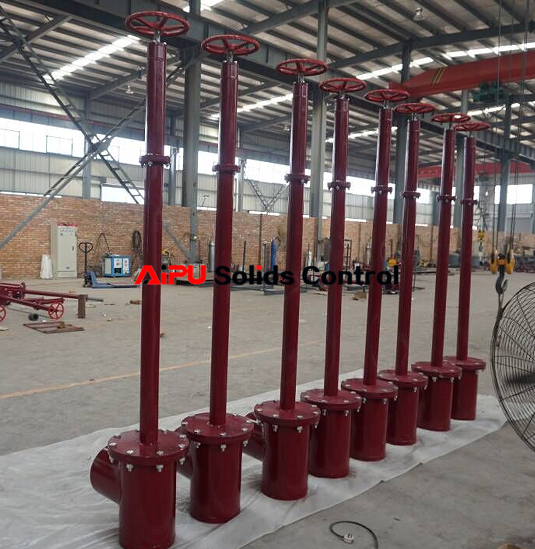 Other tank stand valve for mud tank, The handle type butterfly valve will install for pipeline outlet of mud tank. Each inlet or outlet of centrifugal pump will install a handle type butterfly valve. 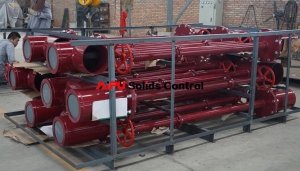 More information please visit AIPU Solids Control by website or email.